Have been looking around the hillside and am struck by the number of sinister plants there are, some of them also beautiful. The other day I spotted a strange phallic object that had snaked out of bare earth. 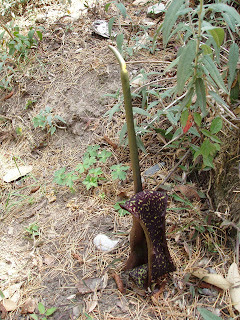 Took photographs, looked it up, and found it is called the Voodoo Lily, apparently a favoured house plant in some parts of the world because the corm flowers minus any soil -- put it on your window sill and there's the flower, in a few days. I wouldn't allow it anywhere near my house though. It's single petal falls in a revolting leathery fold on to the ground and is spotted, like snakeskin. The mile-long stamen looks like a sting. To attract flies, which are its main pollinators, the lily gives off a foul stink, like that of carrion. And after the flower falls off it develops a red corn like seed -- I know of a child in the neighbourhood who almost died because she ate a tiny bit of that cob, attracted by its pretty colour. After the flower falls off, the plant develops a pretty necklace of leaves. But grazing animals, being wiser than humans in some things, know it's not a salad plant and give it a wide berth.